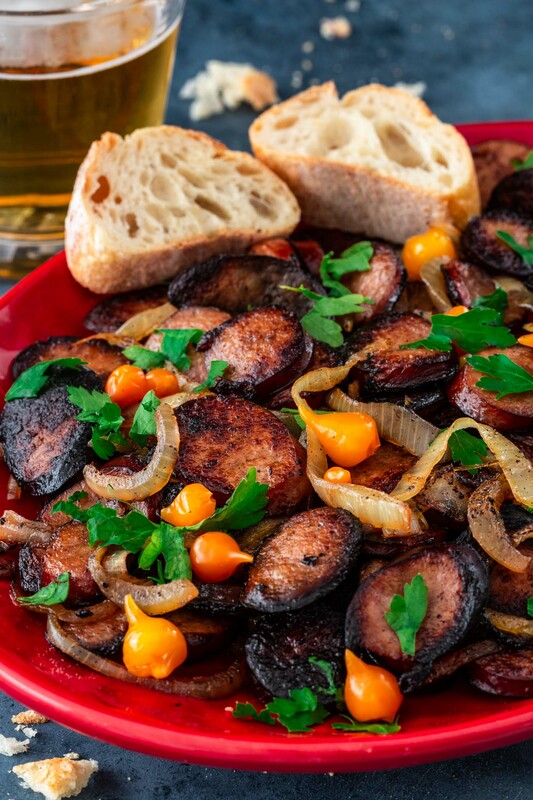 Sliced Kielbasa sausage flambéed with cachaça is a popular Brazilian bar snack and a great one bite appetizer to eat while yelling at the TV on Super Bowl Sunday! For me, Super Bowl Sunday means tasty snacks and finger food! Truth be told, I’m not a huge football fan. But I never miss a Super Bowl gathering! Who in their right mind would pass on all the delicious nachos, creamy dips, chicken wings and fried cheesy goodnesses? Not me! Unless you are out of luck and end up in a party with store bought chips and salsa. Oh, the nerve! I mean, if we are going to cheat on our diets, it has to be worth it, right? We all deserve better than sad looking supermarket party platters! Gourmet sports bar food is the name of the game here and we are playing to win! In that spirit, I’ve decided to borrow this delicious Linguiça Bêbada recipe from Brazilians, who certainly know how to celebrate sports. One of the many valuable things I’ve learned from my dad is how to entertain at sports get-togethers. 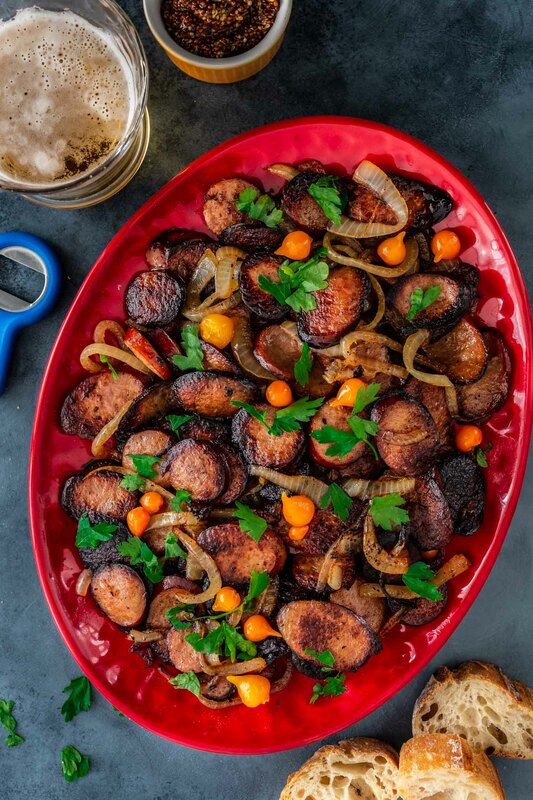 These Kielbasa Sausage Bites would make him proud! They are easy to make, require only 3 main ingredients and are always a hit among my guests! 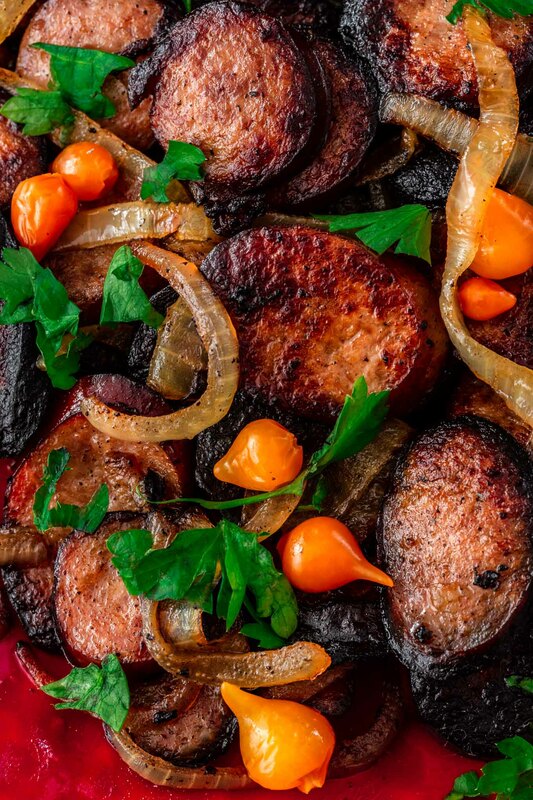 There’s something about perfectly charred sausage with a hint of cachaça that scores all the touchdowns in my heart. Especially when served with a delicious crusty bread! If you’ve ever been to a Brazilian boteco, you’ve probably noticed that we LOVE our apps. Brazilians can stay at a bar for hours, drinking beer and sharing appetizers, no main course needed! One of our favorite snacks to share was Linguiça Bêbada, which translates to “Drunken Sausage” in English. It’s a super simple dish, but packed with flavor! Just sliced Calabresa sausage, sautéed with onions and flambéed with a dose of cachaça to give it that extra oomph. Garnishing with pickled hot peppers and parsley is optional! Can’t find Calabresa sausage? That’s okay, I can’t either! 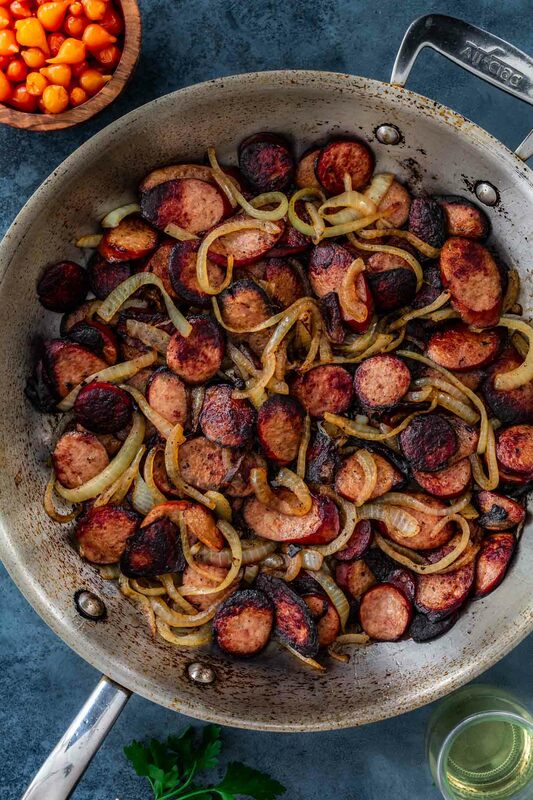 Kielbasa (or any other smoked sausage) works just fine. Flambéing can be intimidating! Even after having done it a bunch of times, I still get a little jittery. Setting things on fire is fun and dramatic but can be dangerous, so you should take all the precautions necessary to be safe! The first step is to understand what flambéing is and why do we do it. Flambé means “flamed” in French and is a cooking technique where alcohol is added to a hot pan to create a burst of flames. The goal is to eliminate the harsh taste of the liquor while keeping its subtler tones, intensifying the flavors of the dish. While you might be tempted to show off to your friends, leave the table side drama for restaurants and do it in the kitchen. I can’t stress enough that safety should come first, always! Have everything ready before hand. I like to remove anything that is flammable from the area around my stove (including rolling my sleeves and tying my hair) and I always keep a pan lid near by, just in case I need to extinguish flames that could get out of control. Having a kitchen fire extinguisher is also a must! Choose an 80-proof liquor or 40% alcohol. Anything above 120 is highly flammable and considered dangerous. Lower proof alcohol, like beer, champagne and most wines, are not effective for flambéing and will not ignite when held to the flame. The exceptions are fortified wines, like port, sherry, vermouth, Madeira and Marsala. Choose the right pan! A flambé pan or wide skillet with sloped sides and a long handle is ideal. Pour the alcohol into a cup or small bowl first. Do not pour directly from the bottle because you don’t want to risk igniting the whole thing while it’s still in your hand! The alcohol should be warmed to about 130 degrees F before adding to the pan. Be careful not to boil it, or it won’t ignite. You can microwave it for about 15 seconds or until it is just warm to the touch. Also, make sure the food is hot! Cold food will not allow the alcohol to catch fire. Always remove the pan from the heat source before adding the alcohol. This is especially important if you’re working on a gas burner. You don’t want the alcohol to ignite unexpectedly, before you are ready for it. Use a long stick lighter. You might have seen professional chefs just tilt the pan til so the fumes can touch the burner’s flame, but a lighter is safer and helps create a distance between you and the flame. Always ignite the fumes at the edge of the pan, not the liquid itself. Once you add the liquor to the pan, light it right away. If you take too long, the food will absorb the raw alcohol and might not ignite. Be prepared for a possible whoosh of far-reaching flames. Stand back and avert your face. In fact, because of safety, I don’t have a photo of the flambéing process for you. While it would have been so fun, there was no way I could safely flambé and work with my camera at the same time. And since I’m the only one in my family who can do both of these things, you will have to resort to your imagination! As I mentioned earlier, Linguiça Bêbada is usually made with linguiça Calabresa, a common sausage in Brazil. It’s originally from the Calabria region in southeastern Italy, hence its name, and it’s usually made of cured pork and Calabrese peppers. In Brazil, you can easily find it fresh or smoked. Here in the US, you probably won’t find it at all, unless you live close to a Brazilian market. 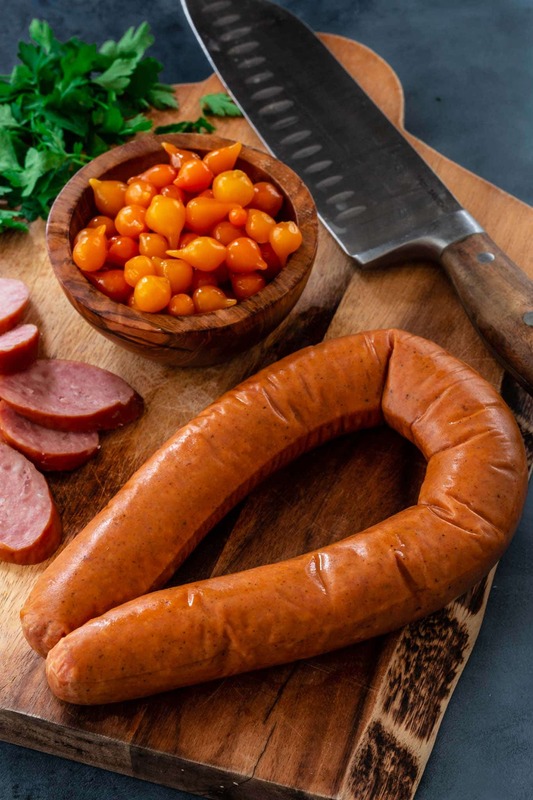 While Kielbasa – a Polish sausage often flavored with garlic, pimentos, cloves or marjoram – is not exactly the same, it is a good substitute. As is any other smoked sausages, Portuguese linguiça or chorizo. 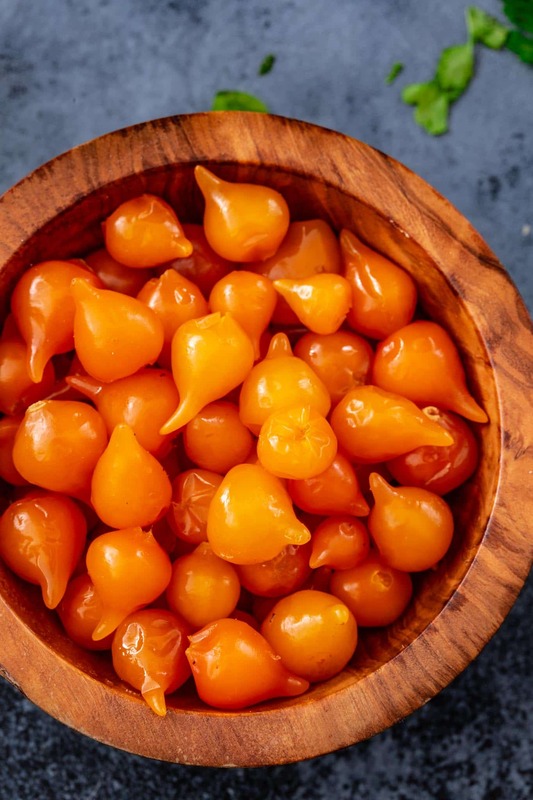 One of my favorite Brazilian hot peppers, Pimenta Biquinho (Little Beak Pepper) are mild, round, little peppers that have a distinctive tail that resembles a birds beak or inverted teardrop. You can find them red or orange/yellow. They are not super hot and have a delicious fruity sweetness to them! Brazilians love using them pickled, as a garnish for main dishes, appetizers, pizza or barbecues. If you ever visit Brazil, make sure to visit a local Mercado Municipal (big food markets in the main cities) and you will probably find a huge variety of pickled Brazilian peppers to bring home! I usually bring a few with me whenever I visit home. Here in the US, you can sometimes find them as “Sweety Drops“. You can also find Pimenta Biquinho seeds and plant them in your garden! They are beautiful ornamental plants and, from that, you can make your own pickled hot peppers. They are totally optional in this dish, but add a nice sweet heat to the sausage. You can also substitute for any other pickled small chili pepper – mild, medium or hot. What to serve with Kielbasa Sausage Bites? In Brazil, these are usually served accompanied by mashed yucca or potatoes and served with crusty bread and hot sauce, hot pepper jam and/or mustard. 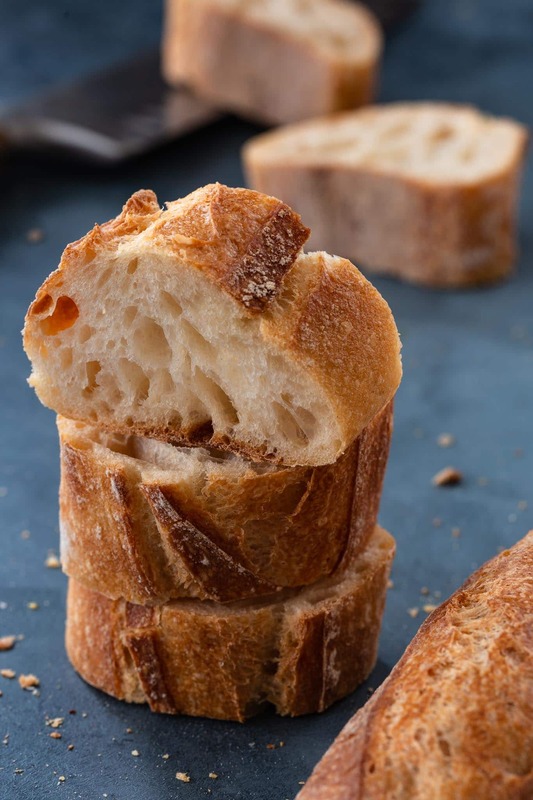 For me, the crusty bread, preferably a baguette, is a must! As is mustard for dipping. Garnishing with chopped parsley and pickled peppers add a fun touch of color, freshness and heat. You might also want to provide tooth picks for easier grabbing and dipping. Oh, and I probably don’t need to say this, but don’t forget the beer! These pair great with a golden pilsner. Anything with high foaminess and light flavor. Ice cold, always! So what do you say? Are you ready to up your game and score big this Super Bowl Sunday with these amazing kielbasa bites? They are so good, they will be gone by halftime! In a large, long handled skillet, heat the olive oil, over medium heat, and sauté the sliced sausage until browned. Add the onion and keep sautéing until they begin to caramelize, about 5 minutes. Heat the cachaça for about 15 seconds in the microwave, until just warm to the touch. Remove the pan from the burner and carefully add the cachaça to the pan. Using a long stick lighter, ignite the fumes at the edge of the pan, protecting yourself from the flames. Return to heat and shake until flames burn down. Transfer to a serving dish and garnish with parsley and pickled hot peppers, if desired. Be sure to read my flambé safety tips before you attempt it.